Obesity – Locum Tenens (Temporary) Dentist – Gregory Cole, D.D.S. “What do drug addicts, serial dieters and children from troubled homes have in common? Stress can play a pernicious role in triggering a vicious cycle that leaves these groups overwhelmed by uncontrollable impulses and distracted by negative feelings — all of which may, in turn, spark subsequent cycles of relapse, bingeing and failure. “Danish drug maker Novo Nordisk said it could launch obesity treatment liraglutide in the United States by the end of next year and rejected some analysts’ doubts over the medicine’s commercial potential. The world’s biggest insulin producer is hoping the treatment for severe obesity will help to at least partly offset the delay to its next generation insulin treatment Tresiba after U.S. regulators asked for more tests.Novo said on Thursday a final stage clinical trial showed patients treated with 3 mg of liraglutide – which is already on sale as a treatment for type-2 diabetes under the brand name Victoza – had an average 8 percent weight loss.But some analysts on Friday questioned whether the results were strong enough to secure the drug’s success. CDC Warns Of Spread Of Deadly Antibiotic-Resistant Bacteria -An antibiotic-resistant family of bacteria continues to spread throughout the U.S. health care system and is now prompting warnings from the Centers for Disease Control and Prevention.The bacteria, Carbapenem-Resistant Enterobacteriaceae (CRE), kill up to half of the patients who get the bloodstream infections from the disease. The disease has evolved a resistance to carbapenems, also called last-resort antibiotics.In addition, the CRE bacteria can reportedly transfer its resistance to other bacteria within its family. The transfer of resistance can create additional life-threatening infections for patients in hospitals, longer-term health care facilities, and possibly otherwise healthy people, according to the CDC. For the third consecutive year, residents of the Boulder, Colo., metro area are the least likely to be obese, at 12.5% in 2012. Residents of McAllen-Edinburg-Mission, Texas, continue to be the most likely to be obese, at 38.5%. Adult obesity rates are higher than 15% in all but two of the 189 metro areas that Gallup and Healthways surveyed in 2012. Here is the chart for the worst areas for obesity. Obesity continues to be a problem in the United States and follows demographic trends. Nationwide, 26.2% of Americans aged 18 and older were obese in 2012, unchanged from 26.1% in 2011. Of the 189 reportable metro areas surveyed in 2012, 102 had obesity rates lower than the national average. Nineteen of the 25 most populous metro areas surveyed boasted obesity rates lower than the national average. Smaller metro areas were more likely to have above-average obesity rates, consistent with past reporting. In the 11 metro areas with the highest obesity rates, the average annual wages are lower than in the 10 areas with the lowest obesity rates, reflecting the link between obesity and poverty. The average annual wage in the 11 areas with the highest obesity rates is $38,550, this compares with an average annual income of $47,783 for the 10 areas with the lowest obesity rates. Additionally, residents in the most obese areas, on average, earn $7,240 below the national mean wage of $45,790, while residents of the least obese areas average $1,993 more annually than the national mean wage. Residents in the areas with the highest obesity rates are also 7.9 percentage points less likely than are those in the areas where obesity is lowest to have enough money to be able to buy food at all times. They are also 6.5 points less likely to have enough money for healthcare and medicine. Americans were as likely to be obese in 2012 as they were in 2011. But the 26.2% who were obese in 2012 remains slightly higher than the 25.5% recorded in 2008. 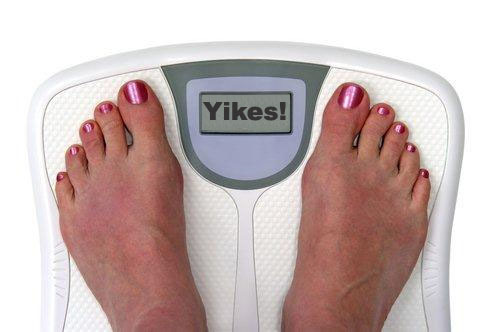 Another 36.1% of Americans were overweight in 2012 and about as many were a normal weight — 35.9%. Those with BMIs of 40 or higher — obese class III — are often considered “morbidly obese.” Based on self-reports of height and weight, 3.6% of American adults were “morbidly obese” in 2012. This is on par with 3.4% in 2011 and 3.5% in 2009 and 2010. The bottom line is that there is much to do for better health. Obesity is a preventable condition and with better education, Americans will be able to live longer and healthy. Colorado had the lowest adult obesity rate in the nation in 2011, as it did last year, and is the only state where fewer than 20% of adults are obese. 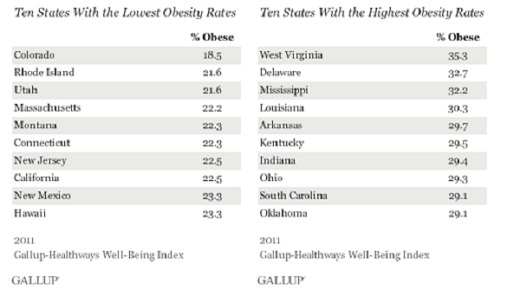 West Virginia holds onto the negative distinction of being the state with the highest obesity rate; 35.3% of residents living there are obese, the highest for any state that Gallup and Healthways have found since 2008. The national obesity rate declined slightly to 26.1% in 2011, from 26.6% in 2010. Across states, obesity rates remained statistically unchanged from 2010 to 2011 in all but two — New Jersey and Kentucky — where they declined. This marks a positive change from the recent past. 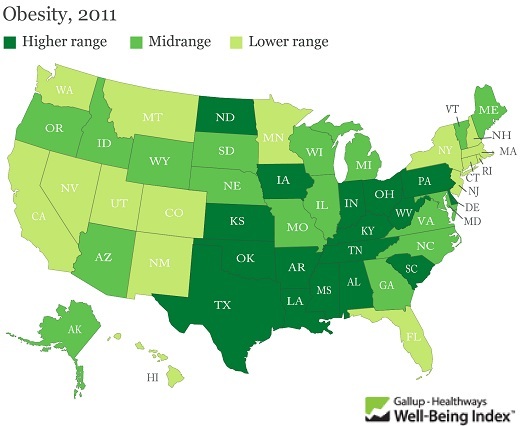 Obesity had inched up in 2009 and 2010 compared with 2008 nationwide and in some states. These data, collected as part of the Gallup-Healthways Well-Being Index, are based on respondents’ self-reports of their height and weight, which are used to calculate Body Mass Index (BMI) scores. Americans who have a BMI of 30 or higher are classified as obese. The obesity rate continues high, but at least it did not increase this past year. Is the word getting out about the problem? It is interesting that the states in the South and the Midwest lag the other states and have higher rates of obesity and chronic diseases. They also have the higher rates of smoking. There needs to be more awareness and education about the needs to eat right, exercise regularly and not smoke – for a more healthy and productive life.